Experience music the way it was intended with these Sony on ear bluetooth wireless stereo headphones. With 20 hours of battery life, you will be able to listen to your music longer and with the comfortable leather cushioned ear cups, you won't ever want to take them off. The rich tones coupled with the clean deep bass will prove why Sony is the world leader when it comes to audio listening. The swivelling and rotating ear cups insure a perfect fit everytime. the built in microphone provides crystal clear calling while the ear cup controls give you complete control over your music. Press the play button twice to activate your voice assistant while the built in audible feedback gives you the status of power and pairing supported by audible tones guiding you through every move. Speak to your friends, and talk to your voice assistants without even taking your phone out of your pocket or bag. Press the play button twice quickly on your headphones to activate the voice assistant on Android or iOS and make easy, hands-free calls with the high-quality built-in microphone. The lenses on your smart bluetooth sunglasses are 100 percent Ultraviolet protected to keep your eyes healthy and defend them from the sun’s rays. They’re also polarized and mirrored to significantly decrease sun glare, giving you full clarity of vision and allowing you to always see where you’re going. Your bluetooth music sunglasses are comfortable and easy to use. Available in black with blue tinted mirrored lenses, black with red tinted mirrored lenses, and black with gray tinted lenses. Make your color choice from the drop down box before adding to cart. This awesome wireless bluetooth earpiece is the perfect choice for talking on the phone. Use it in either ear or connect the included additional earpiece cable and create a bluetooth stereo headset. Comfortable and lightweight, you will forget you have it in your ear. And with its included 4 rubber ear tips and two sizes of ear hooks, you will get the perfect fit every time. The rubber ear tips are designed to keep the earpiece stable in your ear while allowing you to hear what's going on around you. The additional ear hooks can be added for a more secure fit. The included case and clip allows you to store your earpiece while not in use and clip it to a bag or backpack for easy access. The audible voice feedback lets you know when power is on and the earpiece is connected. Hold down on the main side button to activate your voice assistant like SIRI or google. Press it once to answer a call and again to hang up. Press it twice quickly to redial the last number called. The easy to feel power switch makes it simple to know if the power is on or off and the easy to feel volume buttons allow for easy adjustment. Hold down on both volume buttons at the same time to put your call on mute and hold down again to take them off of mute. These actions give tones to indicate this operation. The 24 hour battery life will keep you talking for a long time while the headset is crystal clear for your callers but blocks out background noise. In-ear SILICONE design with 360 degree adjustable EAR HOOKS to keep the earpiece in place. No worries of it falling out, even if your head is down. •Extra three EAR TIPS and extra ear hook ensure comfortable wearing. •0.4 ounces / 12g light body, no heavy feeling. no need to use hands to answer calls when you are driving. Stay in or Go out,the Choice is Yours! Headphones or Speaker,the Choice is Yours! Use this bluetooth headset as a wearable speaker or keep it personal with the retractable noise isolating earbuds. The choice is yours, all you need to do is flip the switch and the device will do the rest for you. 4 strategically placed speakers designed to deliver the best in dimensional surround sound. The newest Bluetooth V4.1 technology makes sure you will keep connected. The 4 strategically placed speakers designed to deliver the best in dimensional surround sound.Advanced CSR 8645 chip and Bluetooth V4.1 technology creates perfect balanced stereo sound. These wearable speakers and headphoens are packed with technologies that create a truly unique listening and phone call experience.No more wires, just the crystal clear sound. With your ears free, you can stay aware of what’s around you while you enjoy your music. But there are other things you want to hear, too. Like taking a call from a friend. This around the neck headset keeps you closer to all of it, your music, your surroundings and both at the same time. These bluetooth speakers and headphones are flexible and durable. And since it form-fits your shoulders in whatever position you leave it, you’ll hardly know you’re wearing it. The headset speaker is sweat and weather resistant, with an IPX4 rating. And the high-quality speaker cover repels dust. A pleasant female voice announces connection and battery status upon turning on the headset. Furthermore, when a call comes in over the headset, hear a female voice speak the number to you of who's calling. 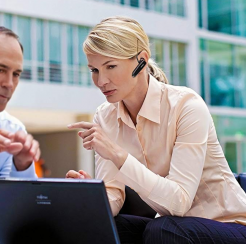 Vibration of the headset alerts you to an incoming call as well as powering up and down the headset. Easy to feel Controls allow for Siri or google voice assistant activation with the press of a button. Other controls include volume up and down and track skip forward and backwards as well as a play/pause button. An easy to reach switch changes the sound from speakers to earbuds and back again while another switch powers on and off the headset. You’re free-spirited. Un-relenting in your pursuit of reaching your potential, your apex. Meet your in-ear companion and the only match for your intense training. The Raven liberates you from the annoyance and restrictions of pesky wires. Push it to the limit and sweat your guts out. The waterproof IPX4 rated earbuds with their custom ear grips, deliver tunes and calls with superior sound; staying secure in your ear while you get down and dirty or high and mighty - with no strings attached. Listen to music and take your calls everywhere. With 8+ hours of playtime you will never have to worry again about losing power or having to charge your device frequently. Compatible with any Bluetooth device. Once paired your device is remembered and ready to connect at any time. The Talon Grip anti-slip ear grips make sure the Raven stays in place and you can keep your buds secure with the practical and compact storage pouch. Noise Isolating Buds - Drown out the world and swim in the sound. The ultra-innovative noise isolation buds of the Raven will keep out ambient noise so you can focus on what you are listening to without any distractions. The Raven will take you to your own world. The Raven is waterproof IPX4 rated via Liquipel technology, meaning you will never have to worry about water, mud, rain and sweat damage to your earbuds again. The IPX4 rating for the Raven ensures you can keep your tunes playing no matter the weather or situation. The Raven includes an assortment of Premium Sweat proof Noise Isolating Comply Ear tips as well as anti-slip silicone ear tips in a variety of sizes and two cable management clips to ensure maximum comfort and that the earbuds stay where you want them. The Raven will stay secure even during the most extreme activities and active workouts. The Rowkin Bit Charge Stereo is the ultimate set of portable wireless Bluetooth earbuds. The housing conveniently holds your earbuds while doubling as a power bank to keep your devices charged. Compatible with All Bluetooth-enabled Devices. Pairing 2 earbuds wirelessly is now possible, giving you high-quality surround sound wherever you go. With the built-in mic, access to Siri/Google Assistant is just a touch away, giving you a genuine hands-free, wireless stereo experience. The dual-function charger allows you to charge both earbuds up to 15 times and acts as a power bank for other mobile devices. Our super small earbuds combined with the sleek charging container fit right into your pocket. WaterSafe nano-coating technology makes your Rowkin Bit Charge sweat-proof, water resistant and IPX5 compliant. It is perfect for sport, outdoor, and gym activities. With the Rowkin Bit Charge Stereo’s unique patented conductive portable charging system, you can charge both wireless earbuds up to 15 times and use it as a power bank to get up to one full charge on your iPhone 7. Introducing these JBL on-ear wireless headphones. They’re flat-folding, lightweight, comfortable and compact. Under the hood, a pair of 32mm drivers punch out some serious bass, reproducing the powerful JBL Pure Bass sound you’ve experienced in much bigger venues. Music and call controls/microphone are placed on the earcup. And because your music should go where you go, you’ll get up to 11 hours of uninterrupted audio playback on a single charge. 2 in 1 Stereo Bluetooth Transmitter and Receiver. Add Bluetooth to Devices That Don't Have It Like the Victor Stream or Receive Bluetooth On Non Bluetooth Headphones, Speakers, Etc. 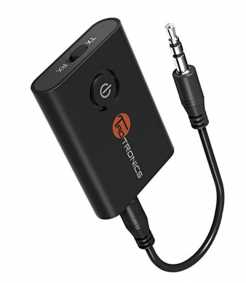 Streaming wirelessly your favorite movies, songs, games, and TV shows is as simple as plugging in a 3.5mm audio jack. Let any media device turn into a Bluetooth-enabled receiver/transmitter. Let your enjoyment know no limit. For the BANG to sound exactly when the trigger is pulled. For the words to be heard as soon as the lips move. For a flawlessly synchronized streaming experience that knows no lag whatsoever. It's always the right time to enjoy yourself. Easily switch between transmitter and receiver mode by flipping a switch. Feel the power at your fingertips with the Wireless 2-in-1 bluetooth Adapter. Uncompromised Sound aptX audio coding delivers real-time streaming high quality stereo audio. Enjoy premium CD-quality audio experience without the nuisance of wires. Untangle the fun. LOW DELAY: aptX Low Latency for High-fidelity Stereo Sound, lag-free content streaming in transmitter mode. •2-in-1 Bluetooth V4.1 transmitter can be paired with two Bluetooth receivers (like headphones + speakers) simultaneously. Note: aptX Low Latency does NOT support Dual Link mode. •ALWAYS ON: Bluetooth 4.1 2-in-1 Adapter continuously streams even while charging. Built-in battery for up to 10 hours use - enjoy your favorite wireless content all the time. •BLUETOOTH EVERYWHERE: In Transmitter mode, turn a non-Bluetooth TV, PC, CD player, iPod, MP3 / MP4 into Bluetooth transmitter. Receiver mode: Ideal for home or vehicle music streaming sound system. Up to 65 foot range.